Note: Having decided that the Torqeedo 1003 electric outboard was limiting my use of Seatern, I bought the Tohatsu in May 2014, when this page was written I was still gaining experience with it. Choice of equipment: I chose the 6hp Tohatsu because that was what other Swallow Boats members were using. The 4, 5 and 6 hp outboards are all the same in terms of size and weight so it seemed sensible to choose the higher power model. 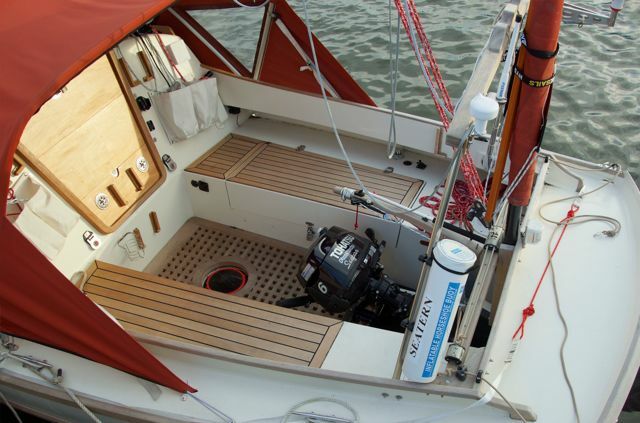 Also, for powering yachts Tohatsu make a “Sail-Pro” model which is 6hp and has a higher thrust prop. It only comes with an “ultra-long” shaft and Seatern needs a short shaft so that model was not suitable. However I had a higher thrust prop installed on the motor with the standard prop kept as a spare. So now I have a short-shaft “Sail-Pro” except that I didn’t buy one with an alternator. Having an alternator and regulator fitted was quoted at £450 which seemed too much given that at low revs I might not get much power generated! Installation: I struggle with a 20kg lead acid battery so I was worried about manhandling a 26 kg outboard. However I was able to lift it out of the car and onto an outboard trolley and to wheel it out onto the jetty. At high tide a friend lifted it onto Seatern’s side deck from where I was able to lift it into the cockpit and onto the outboard bracket. With more experience I find I can handle it by myself. It fitted without making any alteration to the tiller downhaul and uphaul. However it fouled the “knotted rope and shock-cord” tiller tamer which I had installed; I now use a commercial “Tiller-Tamer” made by Davis Instruments which was expensive but works incredibly well. I have situated the external fuel tank in the cockpit locker – having checked that the electric ballast pump (also situated in the locker) is certified for use in the possible presence of explosive gases! I have also inserted vents in the side of the locker lid. In Use: With the throttle hardly open Seatern does up to 4 kt. It may be that 6hp is on the high side for a BC20. Still, the starting rope does not seem difficult to pull and it’s good to have power in reserve. Given that the weight and size is the same, the only advantage of the lower powered versions is the cost. I used it to motor to the Isle of Wight (about 12 nm) and was happily ploughing into a force 4 to 5 head wind even on less than half throttle. That would have not been a possible journey with the Torqeedo. For use on the sea I’ve reluctantly decided that the petrol outboard is essential. Disadvantages: Obviously it is noisier than the Torqeedo, however at lowish power the noise is not too bad and perhaps less annoying than the Torqeedo whine. It takes significantly more space in the cockpit when tilted up. With the fuel tank full I’m adding 26kg weight compared to the Torqeedo. I could counteract that by removing one lead acid battery but would prefer not to do so. I still have to decide. * I certainly won’t be transferring it onto the inflatable so will be reduced to rowing the latter! There are many bits for the main-sheet to catch on, in particular the top of the built in fuel tank – it might have been better to have the “external tank only” model which has a flat top. I’m only using the internal tank as an emergency reserve but there is the danger that the petrol will have gone off when I come to use it. I’ve added Honda petrol stabiliser to try to prevent that.+ I’ve bought an outboard cover which, used when sailing, cuts down the number of places for ropes to snag. Security considerations: Whereas I removed expensive parts of the Torqeedo to the house when Seatern was at the jetty, I can’t do that with the Tohatsu. As well as the outboard bracket lock and Smartwater marking, I’ve painted the boat’s name onto the motor cowl (using a stencil to get a neat result) and I’m hoping that will deter potential thieves. Apparently cowls are quite expensive to replace. I’ve also engraved my house number and postcode on the motor. * I did eventually remove one lead acid battery but the weight saved was partly offset by installing a recharging system for the remaining battery. +[Note added January 2015] When I took the engine in for an “annual” service I had the internal tank removed and the feed from it blanked off. This was a simple job – the tank is only held in place by 2 bolts. I’ve made a blanking plate for the hole where the filling cap was so now the top of the outboard is smooth and will not snag the tiller tamer rope or the main sheet.